SMiSA (The St. Mirren Independent Supporters Association) is a football trust founded in 2002 by mandate of Saints fans. We became an official supporters trust in October 2003 under the name 1877 Society Ltd. Over the years we have supported St. Mirren Football Club in various ways including loaning the club £50,000 for the devlopment of the AirDome behind the north stand. 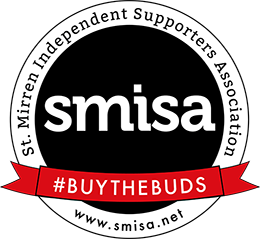 In 2016 we launched our campaign #BuyTheBuds to purchase a majority shareholding in St. Mirren Football club. Phase 1 consists of a joint bid to buy the the Club with former director Gordon Scott, which was successfully completed in summer 2016. Phase 2 will see the Trust buy out Gordon's majority shareholding to allow St. Mirren to become a fmajority fan-owned football club. David has extensive experience negotiating multi-million pound deals with international clients through his role with a large Engineering firm. He has experience working in an in-house legal department negotiating contractual terms and conditions. Currently David is in a business development role. David’s main focus with the trust has been supporting on the legal aspects of the deal. He was part of the negotiating team brokering the deal between the buyers and sellers, and has developed the shareholders agreement between SMISA and Gordon Scott. David has been a St Mirren fan his whole life, his first St Mirren game was a 2-1 defeat to Meadowbank Thistle in the early 1990's, a result which stood David in good stead for the many years of misery to come. With a career that includes Motor Industry Sales Manager, Local Councillor and as the elected MSP for Paisley since 2011 George is the Paisley People Person. Working for the good of his constituents and country has seen George serve on the Scottish Parliament Education & Culture, as well as Standards, Appeals & Public Appointments committees, whilst also acting as the Parliamentary Liaison Officer for the Cabinet Secretary for Education & Lifelong Learning. Chairman of our trust, and approachable liaison between club, supporters and community it is not an overstatement to say George loves his town, his team and the community he serves. He has the admiration of the whole trust board for being the ‘face’ of SMiSA with all that brings. SMiSA Treasurer for over fourteen years, qualified accountant and Financial Controller at Parklands Country Club for over twenty-five years, Jim is SMiSA’S numbers guy who manages our finances ensuring full tracking, recording, accountability and transparency of our accounts. A St Mirren fan since the early seventies Jim immersed himself in writing, editing and selling to fellow supporters a Saints fanzine. His three children and wife Jayne all share Jim’s passion for the club, and it is that he believes shows how important families are to the ongoing success of the club as a community hub. Colin is an experienced media professional, who is the director in charge of the trust's communications output. He devised much of SMISA's fundraising structure and led the communications behind the campaign to sign more than 1,000 fans up. He started his career as a journalist and spent eight years working for various titles in the Scottish media. Since 2011, he has worked as a senior communications officer at Renfrewshire Council, and was the lead officer on the PR campaign behind Paisley's bid to be UK City of Culture 2021, which reached a UK and international audience of hundreds of millions, transformed the town's profile and reputation, and has since won a series of PR industry awards at UK and Scottish level. He has been a St Mirren fan since he was taken as a young child to see the club win the Scottish Cup in 1987, possibly without realising at the time that would be as good as a lifetime of fandom would get. Over the years he has been a regular contributor to the club's website and programme. Kenny has recently retired from the rail industry having worked at senior management levels for many years before becoming a company director for ScotRail. He would love to give something back to the team that he loves and has supported all his life. He has worked with the volunteer squad during the year helping to clean the stadium and assist as required. He hopes that the experience he has gained during his working career could help SMISA drive the club to become really successful. All of Kenny's family are mad keen fans and fellow suffers, both daughters are season ticket holders, his son is a SMISA member and goes to games when he can. His son in law is a season ticket holder and SMISA member and does web design work for the official site. All in all, a St Mirren daft family. A Paisley Buddie, lifelong Saints fan who has seen the club win Two Scottish Cup Finals shows clearly where Alan’s loyalties lie. As a youngster Alan was a visitor to the team dressing room at half time in one game, unfortunately it was for some TLC and an orange after falling down, rather than a first team call up. A retired Chartered Account, who has performed a number of senior roles in Finance in the Whisky industry, Alan has a wealth of experience in internal audit, compliance, system & process implementation and business integration. As SMiSA’s membership and responsibilities have grown, so has the need for Alan’s expertise to deal with our finance and accounting. Graeme's background is in media and communications. He was a sports journalist for 18 years, the last decade of which was spent writing for The Herald and Sunday Herald. He now work for the biggest PR and digital marketing agency outside of London, proving PR and communications advice to major sporting organisations and other commercial firms. Graeme believe those varied career experiences and skills (writing, communications, media knowledge and management, football contacts) would augment SMISA’s existing talent pool. He has been a St Mirren fan since childhood, wrote for the SQ fanzine (including a series of “interviews” with Martin Baker carried out in the Garage nightclub of a Saturday evening) and made a habit of finding the flimsiest of excuses to speak to his heroes for the Herald (favourite interviews: Guni Torfason, Billy Abercromby and Tom Hendrie). Kev has been a supporter of St. Mirren for the last 30+ years and holds a very high passion for the club and wishes to share his vision on club related topics and debates, having the clubs best intentions at the forefront. He is the owner of a small graphic and web design company and has some valuable experience to share about the running of a company from a smaller scale. He has over 12 years industry experience within design for print and digital formats as well as front-end development of websites. His experience of working within publishing, advertising, marketing and web design will add a lot to how SMISA promotes itself. Kev already has a good working relationship with the commercial and media departments at St. Mirren through work he already does for the club through his graphic and web design company KP Kreative on a weekly basis. Janette was elected to the board after time spent volunteering with the organising and working to increase its profile. Janette is a St Mirren season ticket holder and strongly believes in the principle of fan ownership and being involved in the success of the club. Janette is impressed with the model where there is discretion to spend money quarterly on projects to help the club and community. She thinks this takes the level of fan involvement further than other similar schemes. She works as a laboratory analyst in a Public Analyst laboratory. Janette is also the union steward for her workplace. The skills she can bring to being on the board include good communication and mediation. She has an understanding of the importance of equality to ensure everyone is treated fairly. Janette would be looking to actively encourage members to be involved with SMiSA from a diverse background. She also has an HNC in Accounting which gives her an insight into various aspects of business such as forecasting and budgeting. The elected committee members profiled above are regularly assisted in their work by the following SMISA members: John White, Jim Crawford, David Riley and Louise Swanson.